What is the location of Rajyash Serenade Vista?The location of the project is Bodakdev, Ahmedabad West. What is the area of apartments in Rajyash Serenade Vista? The area of apartments offered in the project ranges from 1150.0 sqft to 1440.0 sqft. What is the area of 2 bhk in Rajyash Serenade Vista? The size of a 2BHK unit in the project is 1150.0 sqft. What is the 3 bedroom size in Rajyash Serenade Vista? 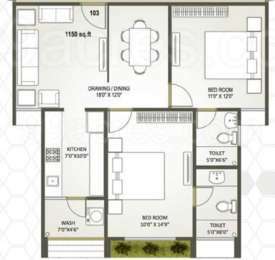 The area of 3BHK units in the project is 1440.0 sqft. How many units are there in Rajyash Serenade Vista?The project offers a total of 15 units. Does Rajyash Serenade Vista have kids play area? Yes the project has kids play area. dication, the builders have successfully changed the face of the Ahmadabad realty market. Rajyash Group has several things in it platter to offer ? from apartments, to villas, bungalows, low-rise apartments; the builders have also forayed into the commercial and residential segment thus, newly built commercial and retail spaces have further started enhancing Ahmadabad?s realty landscape.